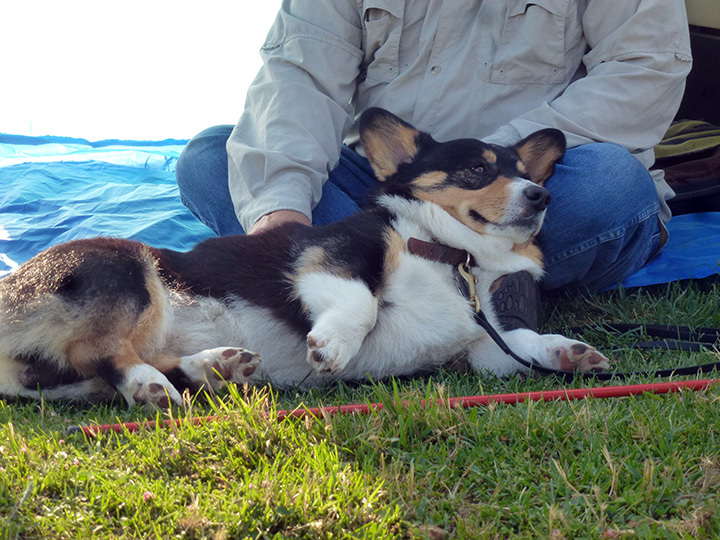 Or, how I earned my title: Ranger the Corgi, HT! 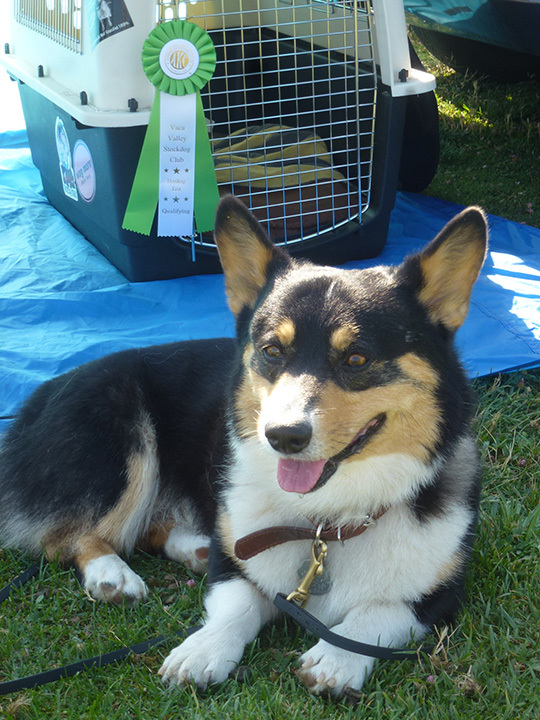 My first ribbon for sheep herding…now I’m Ranger the Corgi, HT! July 4th, 2013, in extreme heat I earned my AKC “Herding Tested” title. I’m now qualified to herd sheep. Next I’ll get a LinkedIn account and get some professional gigs! If you have sheep, please consider having me. I know how to move ’em! Click on the link below to enjoy my first action-packed video. Sorry about the dirt on the lens…I licked it, but it didn’t fix the problem. The best advise we’ve gotten for herding, by the way, is “KEEP ON WALKING.” If you stop and fuss or, ahem…try to fight your dog (me)…things can go wrong. Best to keep moving and things (sheep) fall into place. Your corgi will help see to that. Remember, if you want things to go alright, just try not to be so uptight! Keep on walking! Thank you to Clinton Abbott for being a good trainer. He’s training Elise, I already know what I’m doing. I told her, “mom, you can’t hypnotize them!” how embarrassing. Relaxing with Jeff in the shade. Life is good! 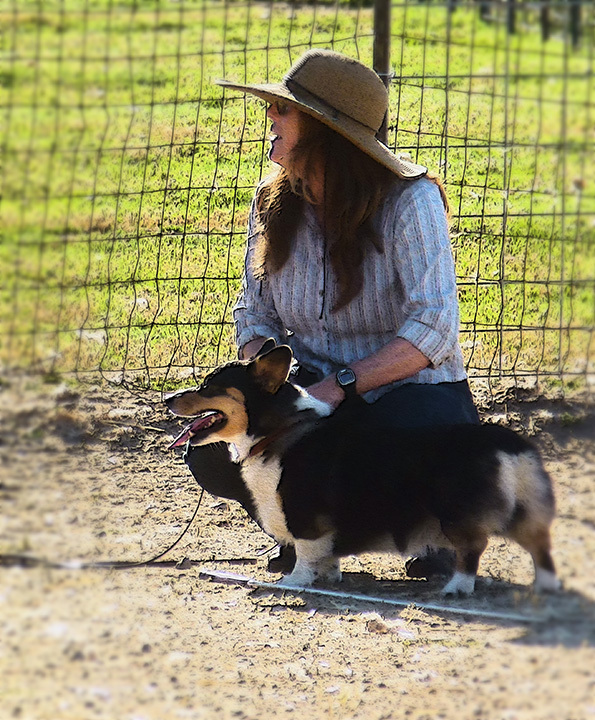 This entry was posted in Curious observations by a Corgi living on the California coast., Dog Blog, Pembroke Welsh Corgi, sheep herding with a corgi and tagged ca, corgi herding sheep, HT tested, HT trial, HT trial with a corgi, Ranger herds sheep, vacaville. Yes, yay is right. Last year he couldn’t quite pull it together. This year he kept his focus, even though it was very very hot out there! Way to go, Ranger Team! Congratulations.